What is this Syrinscape thing anyway?! SIX SETS for the price of FIVE! 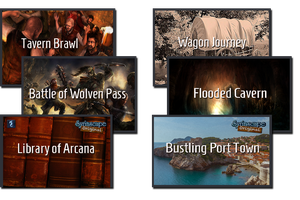 : Bustling port town, Library of Arcana, Flooded Cavern, Battle of Wolven Pass, Wagon Journey, Tavern Brawl. This SoundSet Pack includes an excellent cross-section of the sorts of locations and encounters you need to run any typical Fantasy Tabletop Roleplaying Game. This Pack includes six new SoundSets to add to eight SoundSets that are already included free with the Syrinscape Fantasy Player. You will now be able to take your players to a busy fish smelling medieval port town, a dimly lit and almost certainly 'haunted' magic library, and huge and beautiful flooded cavern with resonant open spaces and a subterranean waterfall, an epic battle field like that on the plains before the white city, a wagon journey across the highlands and a favorite of Syrinscape users, a classic fantasy tavern brawl with all the crockery smashing madness you could wish for! This Soundpack will also get you the Wilhelm Scream.. yes that's right... now you're sure you need it, aren't you! We strongly recommend you support Soundhammer to make more of these great tracks by going here: https://www.patreon.com/soundhammer and pledging a few dollars a month to their Patreon. "Men's yells" performed and recorded by Steve Barr (Caldeth on our forums).